GeoWing Mapping Client Stories - GeoWing Mapping Inc.
​GeoWing Mapping is proud to share a few stories of recent projects. Every mapping project is unique and we value the trust that our clients place in us to find the right solution. ​Following the torrential winter 2017 rains, Contra Costa County contacted GeoWing Mapping to provide emergency drone mapping services. 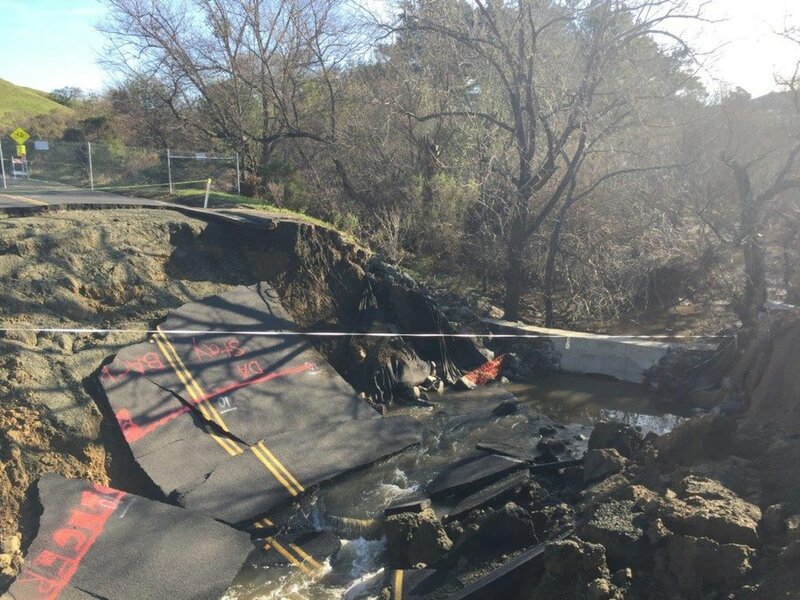 The Alhambra Valley Road wash-out required mapping data prior to road reconstruction. The County did not want to put surveyors at risk by operating near eroded riverbanks and dangerous collapsed road sections. This was a perfect application for drone mapping. GeoWing brought a rotary drone with a 16MP camera and 4K video camera to the site. The 16MP camera was used to capture both nadir (straight-down) and oblique angle images. Oblique angle images provided additional view angles to better define the topography and 3D model of the site. An accurate 3D model of the site was desired by the County to calculate volumetrics. Video imagery was also created to provide visual documentation of the site. One of the advantages of the use of unmanned aircraft systems (UAS) for projects such as this is the ability to maneuver the aircraft under tree canopy. Much of the project area was completely obscured by tree cover, preventing imaging in nadir angle images. GeoWing Mapping was asked by partner SkyIMD to participate in a team mapping effort for Dead Tree Inventory. The study would utilize a new PhaseOne medium-format – the RS1000, 1000 megapixel, 4-band system. Team members included; SkyIMD, Geospatial Innovation Facility University of California Berkeley, PhaseOne, ESRI, Pix4D and Geowing Mapping Inc. 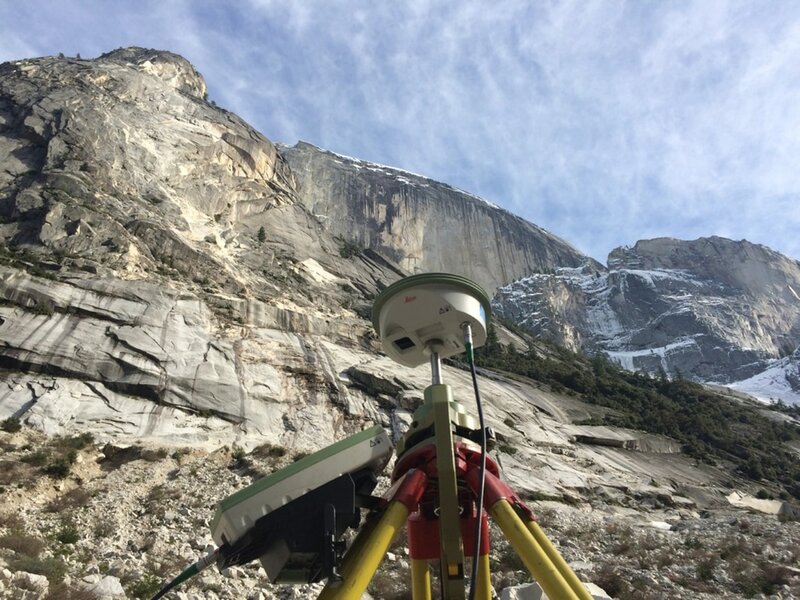 The project area was established over challenging terrain for aerial mapping operations - a 20 square-mile area centered over the iconic land formations of Yosemite Valley including El Capitan, Yosemite Falls, and Half Dome. The vertical relief within the project area was over 4000 feet! The project began with GeoWing surveyors establishing ground control within the project. Survey operations required the use of long observation GPS/GNSS recordation. Inconsistent cell coverage and poor GPS visibility within the steep canyons presented challenges. Placing panels or other target materials into the pristine environment of Yosemite was not an option. Therefore, survey crews constructed or located natural ground features that would be present in the imagery to serve as ground control points (GCPs). Extreme vertical relief is a challenge to the creation of map models. In order to ensure redundant measurement of all areas within the mapping project, the data must possess enormous amounts of image overlap and view angles. 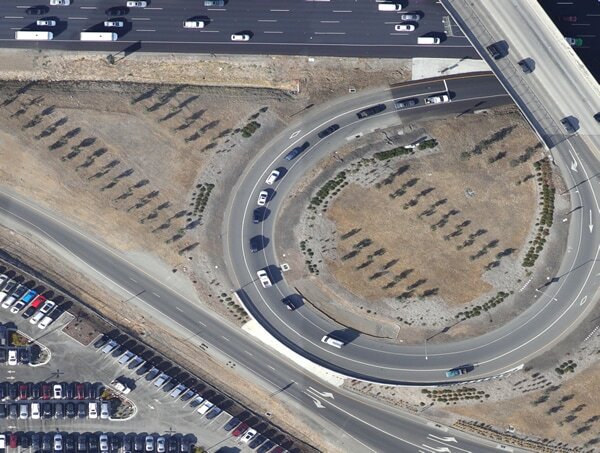 One of GeoWing Mapping’s first aerial mapping projects was to support WRA’s environmental study of vegetation mapping and special-status species habitat monitoring at the Concord Naval Weapons Station site in the Suisan Bay of California. 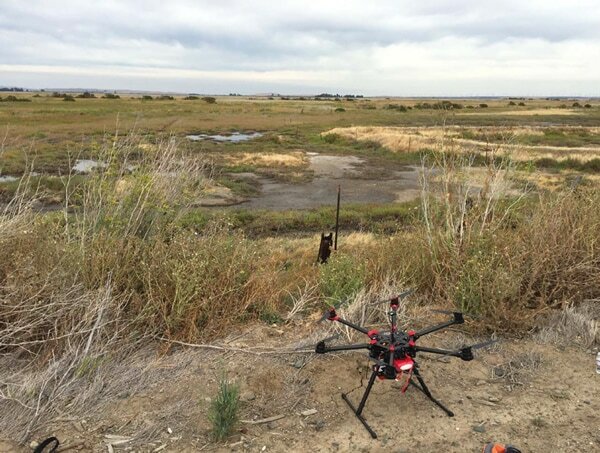 This site had vegetation mapping studies conducted over the last 10 years and this project was to be the first to utilize unmanned aircraft systems (UAS) and drone mapping. GeoWing was selected for this project based upon our credentials in land survey and photogrammetry as well as our equipment which would provide the requisite 4-band image acquisition required for the study. GeoWing survey personnel located panels and surveyed ground control points around the perimeter of the 200-acre marsh site. The image acquisition was designed to break the project into 3 blocks using 3 batteries and flying for approximately 1.5 hours to capture over 1100 images. This project was contracted with a schedule of one week from notice to proceed to delivery of final products. GeoWing met the schedule requirement. 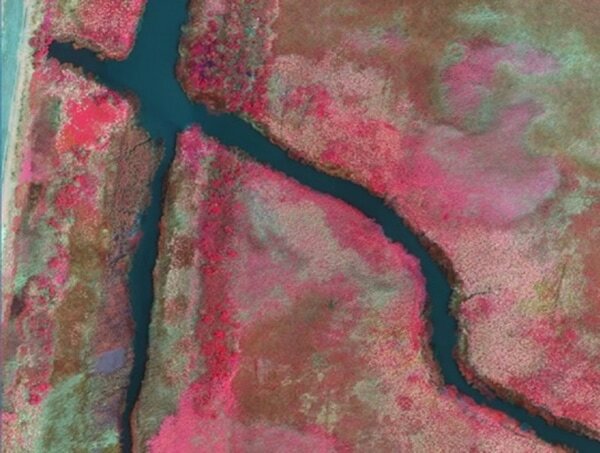 The drone imagery provided was determined to be the best data product to-date for the image classification and vegetation analysis when compared to previous large-format camera collections. Picture: GeoWing drone on the marsh restoration & monitoring project site in Concord. Picture: CIR Orthophotography of the marsh restoration & monitoring project in Concord. GeoWing Mapping was contracted by Anil Verma Associates, Inc. and ARUP to provide detailed survey and mapping data to support engineering applications for the expansion of the Bay Area Rapid Transit (BART) rail line from the current end-of the-line Dublin Station to the new station to be constructed to the east in Livermore, CA. The length of the project was approximately 8 miles and encompassed approximately 2700 acres. This project was revolutionary for BART and GeoWing in that the main map product was to be a detailed point cloud (3D model) and the decision was made to try a relatively new approach to obtain the point cloud. Lidar was the preferred method of obtaining the detailed point cloud of the project area, however BART decided to try a new approach offered by GeoWing using structure from motion (SfM) methodology. 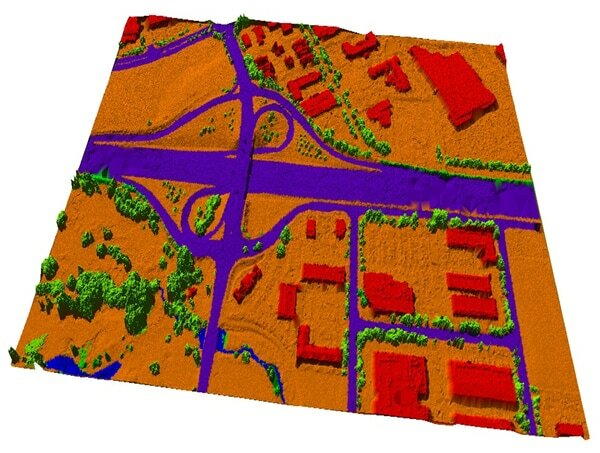 SfM, which is a method of obtaining 3D point clouds from overlapping imagery, was selected based upon a significant cost savings with the expectation that the data set would be similar to a lidar data set. The result was highly successful. In addition to significant point cloud processing, GeoWing provided topographic mapping and creation of planimetric map data in GIS formats. Orthophotography utilized image acquisition from a manned aircraft using a medium format digital camera. 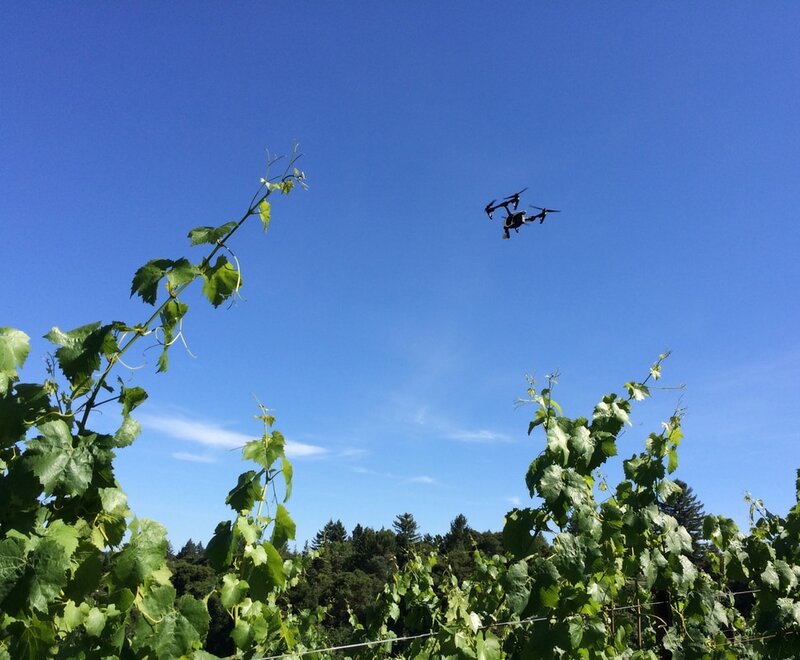 When GeoWing Mapping was contacted by the oldest continuously operating, family-owned winery in the US to provide aerial imaging and GIS services, GeoWing jumped at the chance! The vineyard was pleased that GeoWing offered the ability to capture high-resolution imagery using unmanned aircraft systems (UAS) as well as aerial acquisition from a manned aircraft and multiple sensor technologies. New imagery was to be part of the mapping services however the highest priority was GIS services to organize and map many layers of data and information critical to managing the operation of the vineyard. PDF Map Sheets — Operation of a vineyard requires access to map information in the field away from computers and often away from hand-held tablets. Therefore, GeoWing created PDF Map Sheets which were organized by logical groups and presented on 8.5” x 11” sheets to provide visual information of each ranch with labeled features and color-coded varietal information. In addition, the Wente winery conference room is benefited by having a large wall mount image map of the ranches with GIS data overlays. Once the GIS Map Sheet data is complete new imagery will be acquired to provide as a base map to the GIS features as well as to locate irrigation features.